In order to correctly perceive and interpret the Islamic view of art, the definition of “art” must first be agreed upon. However, this is beyond the scope of this article. It is necessary to point out that art does not solely consist of creating pictures and statues. Art includes discovering details, understanding and portraying profound feelings, and sharing these feelings. Art is the universal language of emotion; images and musical notes only comprise the alphabet of this language. In order to get to the root of the matter, the attitude of the monotheistic religions which came before Islam toward art, as reflected in the sacred books, should be examined. There are no clear statements in the pre-Islamic holy books or in the Qur'an and hadiths (sayings of the Prophet) that clearly define art. The term “esthetic” is a new concept and in the holy texts “beauty” usually means goodness. While the information found in the holy books is more moral advice, it also gives information about the fundamental qualities of art. Since the creation of a visual work of art is commonly equated with the creation of a picture or statue, when art in Islam is mentioned, the focus is on the prohibition of pictures and the debates on the legitimacy of this matter. However, the situation is much the same for music and even literature. “And let them make me a sanctuary; that I may dwell among them. According to all that I show thee, after the pattern of the tabernacle, and the pattern of all the instruments thereof, even so shall ye make it” (Exodus 25:8-9). “Moreover thou shalt make the tabernacle with ten curtains of fine twined linen, and blue, and purple, and scarlet: with cherubim of cunning work shalt thou make them” (Exodus 26:1). The Old Testament states that, “Thou shalt not make unto thee any graven image, or any likeness of any thing that is in heaven above, or that is in the earth beneath, or that is in the water under the earth: Thou shalt not bow down thyself to them, nor serve them” (Exodus 20:4-5). Thus, the limits of art were defined, and the prohibition on the creation of images is found in the second of the Ten Commandments given to Moses. An examination of the holy books shows that the greatest amount of information on issues related to art is found in the Old Testament. The same command applies to Christianity as well. The New Testament reads, “Think not that I am come to destroy the law, or the prophets: I am not come to destroy, but to fulfill” (Matthew 5:17). Some researchers draw attention to Allah's command that Moses make a chest for the Sacred Tablets and that a cherubim be put on the chest (Exodus 25:18-19). Pointing to the story of Prophet Solomon (Saba 34:13) in the Qur'an as evidence, they claim that the prohibition on images only applies to things that can be worshiped and emphasize that the Old Testament does not prohibit images. “O generation of vipers, how can ye, being evil, speak good things? For out of the abundance of the heart the mouth speaketh. A good man out of the good treasure of the heart bringeth forth good things: and an evil man out of the evil treasure bringeth forth evil things” (Matthew 12:34-35). “No man putteth a piece of new cloth unto an old garment; for that which is put in to fill it up taketh the garment, and the rent is made worse” (Matthew 9:16). “Therefore, whosoever heareth these sayings of mine, and doeth them, I will liken him unto a wise man, which built his house upon a rock. And the rain descended, and the floods came, and the winds blew, and beat upon that house; and it fell not: for it was founded upon a rock” (Matthew 7:24-25). Other than the above statements, nothing is said about art and images in the New Testament. As can be understood from these statements, just as the monotheistic religions attempted to establish order, unity, integrity, harmony and sincerity in life, the same values are sought in art. While the New Testament indicates that Jesus came to complete the laws brought by Moses, it does not contain any information rescinding the prohibition on images in the Old Testament. The iconoclastic movement was one of the more striking events that this prohibition brought about. How this prohibition was implemented is another issue. It would be interesting to see the reaction of Jesus, who never went to church in his life, to today’s churches, especially the Roman Catholic churches, which are full of pictures and statues which stem from the influence of the paganist Roman culture. The New Testament recounts how Jesus criticized the Jews who turned the Great Temple into a bazaar. He threw them out saying, “It is written, My house shall be called the house of prayer; but ye have made it a den of thieves” (Matthew 21:13). “So blessed be Allah, the most beautiful!” (Muminun 23:14). It can be understood “the most beautiful” refers to Allah, the most beautiful Creator and the most beautiful. The creations of man are only individual efforts of artistic creation which interpret the beauty created by Allah. “Look at Allah’s dye. And who has a better dye than Allah’s? And we are His worshippers”(Al-Baqara 2:138). “He has created the heavens and the earth in just proportions, and has given you shape, and made your shapes beautiful: and to Him is the final goal” (Al-Tagabun 64:3). “And the Firmament has He raised up, and He has set up the Balance of Justice”(Al-Rahman 55:7). “We have indeed created man in the best of molds” (Al-Tin 95:4). “But He fashioned him in due proportion, and breathed into him something of His spirit. And He gave you (the faculties of) hearing and sight and feeling (and understanding): Little thanks do ye give!”(Al-Sajda 32:9). “Verily in the heavens and the earth, are Signs for those who believe”(Al-Jathiya 45:3). After mentioning the perfection of the things He created, Allah calls upon man to contemplate and to come to an understanding of this perfection. It is indicated in the verses above that Allah created man in the most beautiful shape and the universe with great wisdom; there is measure and balance in the creation of nature. The proportion known today as the “golden ratio” is found in the measurements of the human body which was created in the most beautiful shape. Indicating that ears, eyes and hearts were given to man, the Qur'an stresses that there are signs in the heavens and on earth for the believers, and that the Qur'an has shown how to read these signs through the use of the eyes, ears and heart. After mentioning the perfection of the things He created, Allah calls upon man to contemplate and to come to an understanding of this perfection. For those who know how to look and see, the universe is an open book. The ears were created to hear the harmony and rhythm of the flawless order of the world and to hear music in conjunction with the sights taken in by the eyes. The heart, on the other hand, is the crucible of love, affection and ingenious art. A piece of artwork that has not been filtered by the heart cannot carry artistic significance. In order to perceive the Islamic understanding of art, it is sufficient to look at the Qur'an. Possessing unparalleled literary mastery, the Holy Qur'an presents a challenge in this field. The challenge the Qur'an puts forward is expressed in the verse, “Then produce a Sura like thereunto!” (Baqara 2:23). The same challenge holds true for the music hidden in the sound of the Qur'an being recited. The arts which grew out of the Qur'an like calligraphy, gilding, and binding are esthetic delights which Islamic civilization contributed to the world of art. Because the Holy Qur'an gives importance to pure feelings, it did not put concrete limitations on art like the Old Testament did. As mentioned above, while the there are no prohibitions on making images in the Qur'an, there is a strong stand against image making in some hadiths. The strong disapproval of making images comes from the Islamic opposition to idolatry and vehicles which may lead to idolatry, since throughout history pictures and statues have been the main objects used in idolatry. While there are very different views on the subject of making images, the event most frequently referred to is a situation involving Aisha. She hung a curtain with pictures on it at the door to her room. When the Prophet (pbuh) took it down, Aisha used to material to make a pillowcase, and the Prophet did not object to that (Muslim, Clothing: 93). The narration of this event brings up several questions. Was the curtain hung at the door for the purpose of ostentation or decoration? Where was the curtain was hung and what was its function? Why was the Prophet upset with it? The strong disapproval of making images comes from the Islamic opposition to idolatry and vehicles which may lead to idolatry, since throughout history pictures and statues have been the main objects used in idolatry. 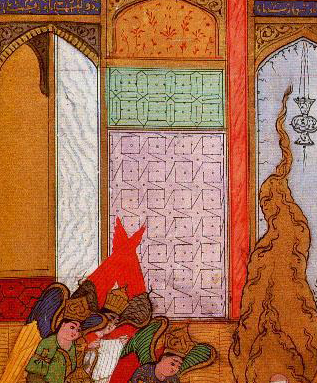 Much of the commentary on this event states that the Prophet took the curtain down because the pictures distracted him during prayer, but the position of the curtain is not fully explained. This curtain is indirectly referred to in the Qur'an: “If you ask his wives for anything, speak to them behind a curtain. This is more chaste for your hearts and their hearts” (Ahzap 33:53). This curtain could be a curtain dividing a section of a house or a curtain covering the entrance door. There is a strong possibility the curtain mentioned in Surat al-Hujurat is the curtain that covered the door leading to the rooms of the Prophet’s wives in the Masjid-i Nabi. In other words, this curtain covered an opening in the wall of the Masjid-i Nabi that served as a door. The front side of the curtain must have directly faced the masjid and the back side faced the room. While the Prophet did not object to material with pictures on it being made into a pillowcase, he, as a prophet dedicated to the struggle against idolatry, was not be pleased with these pictures on the door in the wall of the masjid. It should be noted that after the material was made into a pillowcase, the pictures remained on the material. The only thing that changed was the location of the pictures. These words of the Prophet, who wanted a visually displeasing flaw to be corrected on a grave that was going to be covered with dirt in a few minutes, make up the essence of the Islamic understanding of art: “Allah is beautiful and loves beauty” (Tirmizi, Manners: 41; Muslim, Faith: 147). This essence is found in the small details which grew out of the belief of tawhid (unity). In order toadhere to these fine points, it is necessary to follow the path made clear by Allah. Please type '491' into this field. çok güzel bir yazı ama bu yazının yazarı kim?